Dale Finch, Atlantic City’s director of licensing and inspection, says Trump Plaza will not be demolished yet because of tourism. ‘Both the Atlantic Club and (Trump Plaza, above) have great locations and I am sure can be gotten for a reasonable price,’ said Ken Calemmo, chief operating officer of Cooper Levenson and co-chair of the Economic Development Committee of the Greater Atlantic City Chamber. Liquidators have been at the former Trump Plaza selling off the building’s contents. No date has been set for an auction. ATLANTIC CITY — After more than three decades as a staple of the Boardwalk, Trump Plaza could soon be razed. The facility, which closed in September 2014 as the casino market in the city shrank, is set to be imploded in the spring, Mayor Don Guardian said. The demolition would open several acres of premium oceanfront property that could attract millions of dollars in investment, experts said. Since its closing, the deteriorating property, formerly owned by President Donald J. Trump, has become a symbol of the fall of the city and its gaming empire. 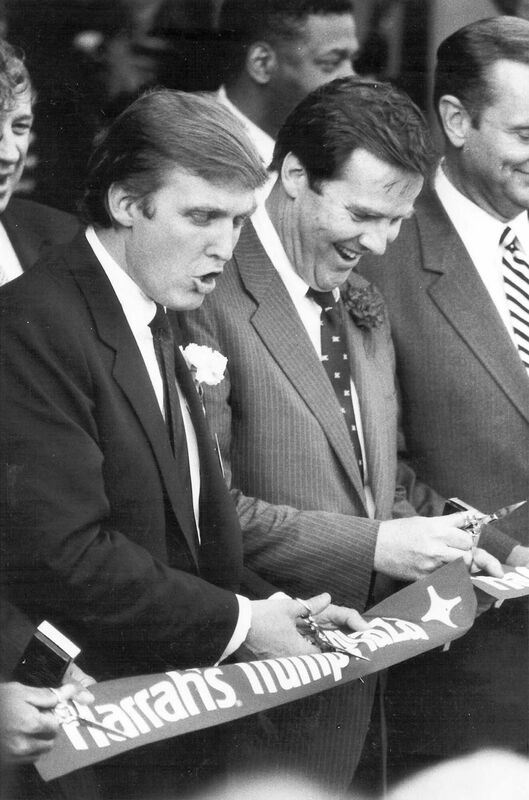 Donald Trump watches the topping-off ceremony for the Trump Plaza Hotel Casino, Atlantic City, March 20, 1987. At left is then mayor James Usry and at right Stephen Hyde, President of the Plaza. The new Fifth Avenue Slots at Trump Plaza. Trump Plaza Hotel Casino outdoor rooftop activities, Lois Greco and Donna Chaloupka of Bethpage Long Island play shuffleboard. Trump Plaza Hotel Casino outdoor rooftop activities: sunbathing. Smokey Robinson at Trump Plaza Theater, Trump Plaza, Atlantic City. Taylor Dayne at Trump Plaza Theater, Atlantic City. Vera Coking gives the victory sign outside her home on Columbia Ave., in Atlantic City, adjacent to the Trump Plaza, after winning her legal battle with Donald Trump Monday 7/20/98, allowing her to save her home. Cheryl Dawson and Andrew Jusino, both casino workers from Atlantic City, shout to cars as they stand with other members of Local 54 in front of Trump Plaza, on Pacific Avenue, in Atlantic City, Thursday afternoon, 9/16/99, despite windy, rainy conditions of Hurricane Floyd. These twenty-some members were some of the only pickets visible Thursday. Miguelina Lopez and Luis Matos, both of Atlantic City, wheel two television sets out of the lobby of the former Trump WorldÕs Fair at Trump Plaza, in Atlantic City, during the liquidation sale Thursday 10/14/99. TVÕs sold for $160 and were one of the hotter items for sale for the hundreds that turned out for the first day of the month-long sale. Hundreds of people who stood in line walk through items for sale at the former Trump WorldÕs Fair at Trump Plaza, in Atlantic City, during the liquidation sale Thursday 10/14/99, buying everything from curtains and tvÕs to the kitchen sinks and beds. Olivia Reynolds, 37 of Atlantic City show she have what it takes to be a Baywatch girl during The Baywatch Search competition on the beach at Trump Plaza, in Atlantic City. The winners will appear on "Baywatch Hawaii." Demolition begins at the Trump WorldÕs Fair hotel and casino, Monday 12/13/99. Trump Plaza is seen at left. Trump Plaza nickel slot lounge in the casino's East Tower: Thursday, July 6, 2000 A large "Nickel Slots" sign hanging over the escalators entering the slot lounge. Security guard Doreen Evans work on the casino floor at Trump Plaza Friday, Sept, 1, 2000. Story about people who have gotten their jobs through the Atlantic city first job Readiness Program. Joe Scuccimarri, of Williamstown, talks with Jocinda Witherspoon, of Pleasantville, both extras in the movie, as they wait for their scene for the movie OceanÕs 11, being filmed at the Trump Plaza Hotel and Casino, in Atlantic City Tuesday morning, 2/13/01. Cartoon star Bugs Bunny is dismantled at the recently closed Warner Bros. Studio Store at Trump Plaza Hotel and Casino in Atlantic City, Thursday 11/1/01, and will be returned to the company's studio. Officials announced that all company-owned stores nationwide will be closed as part of a belt-tightening effort following the $106 billion merger between AOL and Time Warner last January. Bugs, and Daffy Duck, were cut apart and brought down in sections. Mon. 12/10/01 Extras used in the film ÒOcean's 11Ó -- Lou Marchisani (left) and Anthony Martinelli, a pit boss at the Trump Plaza. Martinelli was lucky enough to survive the cutting room floor and made it onto the big screen. Exterior of Trump Plaza Hotel and Casino, Atlantic City, for stock Tuesday 2/26/02. The horse and buggy statues near the Trump Plaza Hotel and Casino parking garage, off the snow covered Pacific Avenue, in Atlantic City, Tuesday 2/18/03. Pete Gaspero, of Margate, and Ann Scavetti, of Ventnor, walk through the pedestrian walkway heading for the casino at Trump Plaza Hotel and Casino, in Atlantic City, while on a casino bus trip that left from Ventnor earlier that day, Tuesday 10/15/02, for story about a group of people in Ventnor who pile into a bus and take a long excursion to Atlantic City. These people are all locals who take the bus to the casino rather than drive. Lifestyle enterprise story. The new marketing theme for Atlantic City, "Always Turned On," is displayed on the large video sign at Trump Plaza Hotel and Resort, off Atlantic Avenue, in Atlantic City, after it was unveiled at a press conference at the Atlantic City Convention Center, Thursday 10/16/03. Jackie Ceresini (R) 19 of Hammonton NJ behind the counter of the Oxygen Bar located in the Beach Bar at Trump Plaza in Atlantic City NJ on Saturday August 5, 2006. On November 23, 2007 The National Sorority of Phi Delta Kappa, Inc. Iona Chapter held their 54th Annual Debutante Cotillion at the Trump Plaza Imperial Ballroom. Debutante Lisa Green, of Pleasantville, performs in one of the choreographed dances of the evening. Contestants competing at the free Black Jack tournament held on the casino floor at Trump Plaza Hotel Casino in Atlantic City on Wednesday Jan 16, 2008. Mark Juliano, Trump Entertainment resort chief executive speak to the media during a press conference in front of Trump Plaza casino on the boardwalk Friday, July 16, 2010. Follow up to no air conditioning in two casinos and the pier will look at the customers' discomfort and inconvenience, the financial impact on the affected properties and the technical work being done to address the problem. An empty casino floor at Trump Plaza in Atlantic City as Trump Plaza remains closed do to no air conditioning. Trump Plaza ,Caesars Casino Hotel the Pier at Caesars and Boardwalk Hall are without air conditioning due to a water main break. . . Saturday July, 17 2010. A security manager prepares to post closed signs on the entrance at Trump Plaza Hotel and Casino, Tuesday Sept. 16, 2014, in Atlantic City. Exterior view of Trump Plaza Hotel and Casino, Tuesday Sept. 16, 2014, in Atlantic City. The business is now closed. a casino floor view at Trump Plaza Hotel and Casino, Monday Sept. 16, 2014, in Atlantic City. The business will close at 6am Tuesday. A security manager posts a closed sign on the entrance at Trump Plaza Hotel and Casino, Tuesday Sept. 16, 2014, in Atlantic City. Signage at Trump Plaza Hotel and Casino indicating a closed section is pictured, Tuesday Sept. 16, 2014, in Atlantic City. From left, Steven Nordaby, of Mays Landing, removes the letters from the Trump Plaza sign off the Boardwalk, in Atlantic City, Monday, Oct. 6, 2014. From left, Steven Nordaby, of Mays Landing, Tony Demidio, of Galloway, and Jim Willimas, of Frianklinville, remove the letters from the Trump Plaza sign off Atlantic Avenue, in Atlantic Cit,, Monday, Oct. 6, 2014. Williams helped attach the letters to the sign in 1993. Jim Williams, of Frianklinville removes the letters from the Trump Plaza sign off the Boardwalk, in Atlantic City, Monday, Oct. 6, 2014. Williams helped attach the letters to the sign in 1993. Slot machines are removed from the Trump Plaza and lined up near the entrance to the closed casino, in Atlantic City, Monday, Oct. 6, 2014. Carl Icahn’s companies have open tax appeals on both the former Trump Plaza and Trump Taj Mahal properties for tax years 2014 through 2017. He also has appealed Tropicana Atlantic City’s assessment for 2015 and 2016. A few walls and rubble are all that remain following the demolition of the boarding house once owned by Vera Coking, Thursday Nov. 20, 2014, adjacent to the former Trump Plaza Hotel and Casino in Atlantic City. Coking, an elderly widow, made headlines for decades in her legendary fight to keep Bob Guccione and then Donald Trump from snatching her property at 127 S. Columbia Place for their casino projects. Demolition of the boarding house once owned by Vera Coking begins, Thursday Nov. 20, 2014, adjacent to the former Trump Plaza Hotel and Casino in Atlantic City. Coking, an elderly widow, made headlines for decades in her legendary fight to keep Bob Guccione and then Donald Trump from snatching her property at 127 S. Columbia Place for their casino projects. say maintaining it also requires money to avoid structural issues. The shuttered Trump Plaza in Atlantic City, pictured Monday Feb. 27, 2017, is expected to be torn down over the next couple of years. A look back at the Trump Plaza, in Atlantic City, through the years by photographers at the Press of Atlantic City.